i've had this card completed for weeks; i guess it's time i finally post it here! 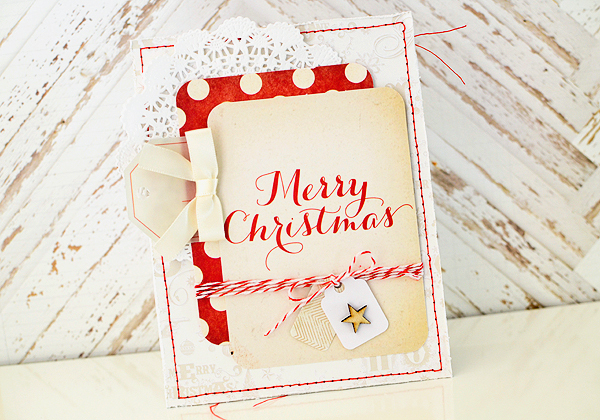 it's the midway point in the year over at Festive Friday...have you managed to get a head start on your Christmas cards? 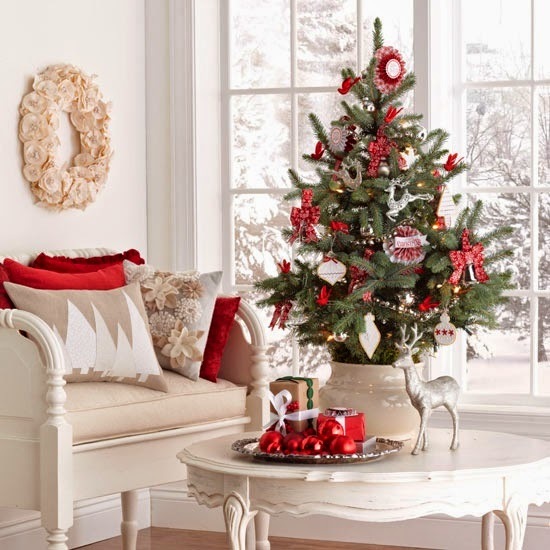 check out this week's gorgeous inspiration photo...i can dream for a corner in my house to look like this, can't i? there were a whole lot of lovely things to choose from, but i was drawn to the different monochromatic creams, whites, and beiges. you can see them in the chair, the pillows, the floral wreath, and even the landscape outside the window. i used pops of red, just like in the photo, to add some interest and contrast. i'm not really a scrapbooker by any means, but i've recently discovered that the Project Life cards are just the right size for card-making, too. am i late to the party on that one? probably, but i'm happy to be better late than never! 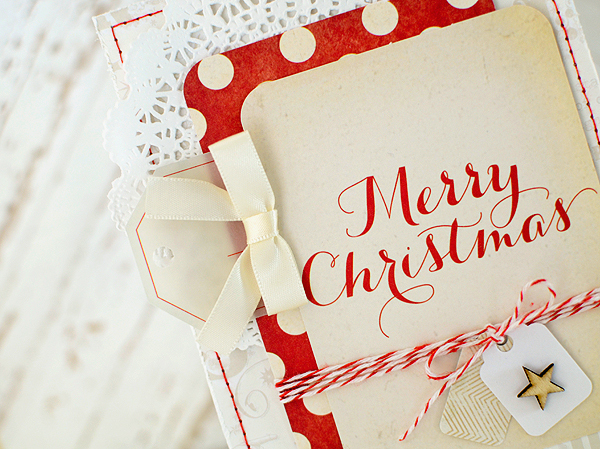 the "Merry Christmas" and red and white polka dot cards are from the PL Holiday Edition kit. my background paper is My Mind's Eye (All Is Bright), and my little beige chevron tag is from the Crate Paper Sleigh Ride line a couple years back. 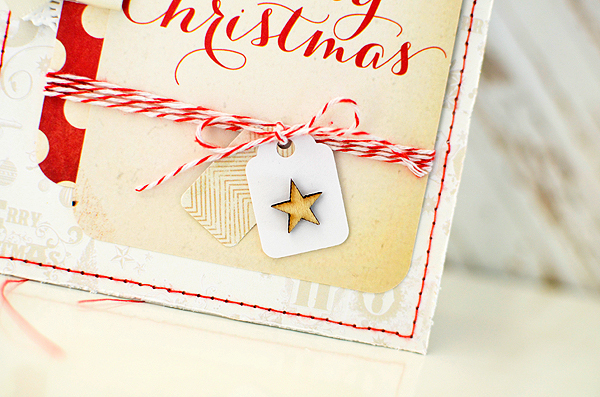 lastly, i added one of my favorite wooden stars from Studio Calico to a bitty white strung tag. it's been another week of ups and downs here...thank you for your kind thoughts regarding this post...to fill you in, we learned a few months ago that my father had a large mass pressing against one of his kidneys. he went through a barrage of tests and months of waiting because every test was inconclusive. in mid-May he had a laparoscopy (a minor surgery) that would hopefully, finally, reveal an answer. my sister went to the hospital with him for that and before the surgery began, his doctor mentioned that he suspected it was late-stage cancer so whatever the results were, the course of action would be to do what he could to "prolong his life." in essence--it was likely terminal. after the surgery was over, the doctor told her that preliminary results showed the mass was lymphoma. he didn't say anything more than that. keep in mind that we lost my mother quite suddenly and unexpectedly in November. in January, we found out about my dad's mass and kidney problems and i don't know about you, but when i hear about a "mass" anywhere in the body, my first thought is cancer. so it's been weighing heavy on our minds for 4-5 months. Dad's doctor went to a medical conference right after the surgery so it was another difficult week and a half of waiting until we had anymore information--what stage was it? how much had it spread? what could be done? and then...oops, no, it's not lymphoma--it's not cancer at all. it's some strange, rare kind of fibroid that has attached itself to many of the organs in his abdomen, including the ureter and bladder. it can't be removed but will hopefully shrink enough through a course of steroid treatments that eventually something can be done about it. so while he is still having issues and still requires some invasive medical procedures, the good news is that he is cancer-free. we had a week or so to be thankful for that news and then my mother-in-law had a heart attack over the weekend. she is ok--she underwent a quadruple bypass on Tuesday morning and seems to be recovering well, though it is still early. we are incredibly grateful that she was given the chance to have the surgery instead of being taken from us. my in-laws live with us so it's been very strange not to have her around this week. so i've said it before and i'll say it again: don't take anyone for granted; you never know when they won't be there anymore. Love this card - perfect for the inspiration! Wow - what a ride you've been having with family health! Thinking of you and hoping for good things! Oh my, you poor girl...my heart goes out to you...hang in there. My thoughts are with you and your family. Your card is gorgeous. I have bought PL cards to start that whole process but just haven't started...so yes, they've creeped into my card making.